Ok so since I joined Tezzaworld in 2008, I have looked at Robin’s car as a serious work of art. The time and effort gone into this car is truly amazing. All the small touches, the unique touches combined with the huge power this is a serious road going altezza with a stealth look. Anyone thinking of building a turbo altezza seriously needs to look at this example and take notes. HKS Ssqv 2 Black Lt Ed Blow Off Valve. TRD quick shift gear stick. Custom Stainless steel exhaust system. Zicrotec thermal barrier coating on exhaust parts. Carbon Fibre Radiator cooling panel. Carbon Fibre fuse box cover. Front and Rear under body chassis braces. Grooved brake discs all round. Late Spec speedo cluster with rev counter in the middle. G-line 509 Wheels with red lip 18x8 et 38. What made you pick an Altezza as your car? I have always been into cars and was looking at moving up to a saloon car as my next project, and had got myself 2ltr Honda accord but after a few months of ownership and seeing an IS200 and doing a bit of research I decided to sell the car on and go with the IS/Altezza platform for my next project, but before I could get 1 I had a few loans to get paid off first. Whilst I was doing this and researching the IS200 I came across a few Altezza's that had been imported to the UK. The same car with 55bhp more, more tuning parts and sweet looking body kit I was sold. I had to have 1. Did you know much about Altezza’s before you got one? Where did you get your altezza ? I spent about 4 or 5 months trying to find a manual model which at the time there was only a handfull in the country and eventually found a member on the Lexus Owners Club who was selling their’s. How long have you had your altezza? I've owned the car for 6 years now. How much you have spent on the car? 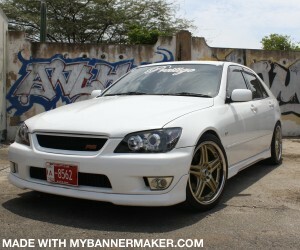 Did you buy your altezza modified or is it your own work? The 1st owner had done a few mods to the car but I have replaced most of these over time. If its your own work, where do you get your ideas? Past cars I had owned I had always done more styling mods rather than tuning so I wanted to do a car which was more tuning based, where every modification had a reason or use behind it. Why did you modify the car? I never intended to do a turbo conversion on the car when I first got it. The plan was to build a fast 2lt NA car, but before I could finish this I found out the car was down on compression, which ment a new engine or a rebuild, rebuild it was. Whilst saving up for the rebuild I got carried away looking in the parts catalogue and ended up buying a 2.2lt low compression stroker kit, so from then on it all came about the boost. Is there anything you don’t like on the car? Yeah there a few bits on the car that I need to get sorted. A few touch ups on the paint work here and there. What part of the car would you like to modify next? I'm looking into heat management at the moment as this is next on the list of things to do, as well as finish off fitting the rest of the sensors for my gauge install when the parts arrive. I still have lots to do on the list. Anywhere I can, I've brought items from all over the world in the past so it's really just the case of locating what I need and where to buy it from this can mean a bit of hunting about though. If I can buy the part here in the UK I will, but the price has to be right otherwise I will buy it from over seas. Yep the cars had a few dynos in it's time but the last 1 was at Torque Developments International when it had the new exhaust system fitted. The car made 329bhp at the hubs. No nothing done since then, I'm still in the planning stages. times did you have ? I've done a few small sprint/go-cart tracks with mates just for fun in the past but nothing to serious. Does your other half know how much money you have spent on the car ? What is the worst mod you have seen on an Altezza ? Hmmm dunno there a few things I've seen that I'm not a fan of, but some people are going for different looks and that’s what there into. To pick 1 of the top of my head I would say lambo doors are a no no. What is your fav modified car? What cars have you had before the altezza? I've had a few hatch backs I've modified in the past which included a peugeot 306 and 205GTI (1.9) which I had great fun in but alot of the time I've had old run around’s to use for work. No I would buy something different maybe go down the VIP styling road. Arguably one of the best tezzas on the site, stunning example. great car. lots of effort. well done robin. great pics too. thats like a christmas list for most of us!! stunning car and build top work robin its a credit to ye!! Serious bit of motor there lad.